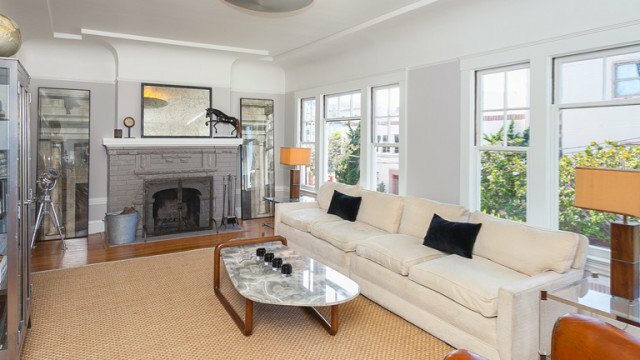 This stylish top floor condominium is situated on a fantastic tree-lined block, only steps away from the heart of Cow Hollow. Its thoughtful and extensive remodel included an updated floor plan with expanded closet space in the master bedroom, electrical and plumbing upgrade and the creation of a full second bath. The bright kitchen boasts a Viking range, Bosch refrigerator, beautiful marble counter tops and sharp white cabinets with plentiful storage. The living room is a great space to spread out, with outlooks that offer a peek-a-boo view of Alcatraz and a wood-burning fireplace. It is connected to a truly elegant dining room that is made for entertaining. The master bedroom feels private and overlooks a colorful yard (shared). One car parking, in-unit laundry and additional storage in the garage add to this home`s timeless appeal.